I’ve just returned from a vacation so absolutely wonderful that it seems like a dream, did I really just see a truffle pig??? But while I was away, I was often thinking of raspberries; I was worried that the season, always a short one would be over before I got back. Fortunately for me, raspberries are still in season and will be for another few weeks, and luckily, I didn’t have to battle black flies, mosquitoes, snakes (yuck) or bears, just a short drive out of town to Turners Farm Market on highway # 2 where there many boxes of the recently picked ruby hued berries, and at blueberries too. A heavy flat later and I’m on my way home to start cooking. 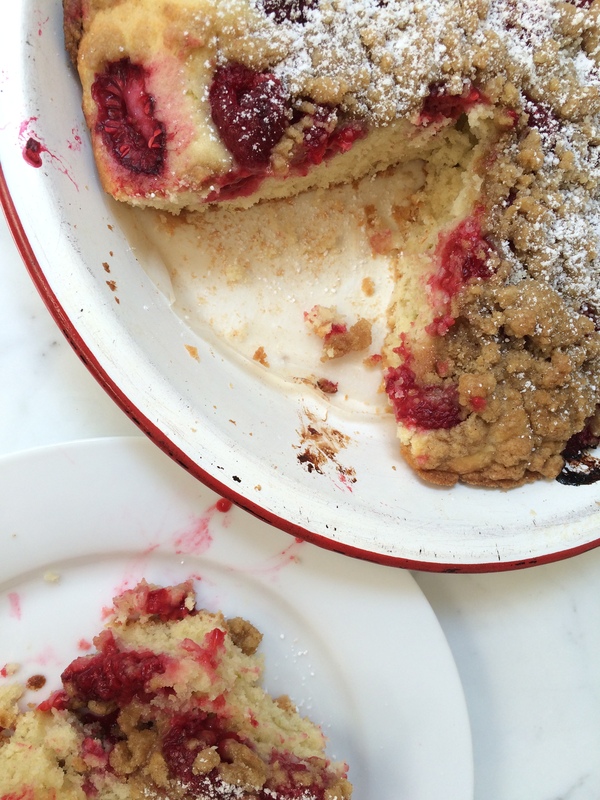 The first thing that I always bake is Madame Benoit’s appropriately titled First Raspberries Coffee Cake. It’s easy and quick,and gets me primed for the raspberry work that lies ahead; jam, a pie or two. preserves for sure, and of course the vinegar, a staple of my pantry and of pioneer life in Canada, as good things should never change. “When the first raspberries ripen in the garden, we eat a large plateful topped with maple sugar and yogurt, to taste. The next day comes the coffee cake, light, tender, perfect with tea. When the raspberries are finished, repeat both treats with blackberries,” Madame Benoit. Cream together until light and fluffy, the butter, sugar, vanilla, and lemon peel. Beat in the egg. Sift together the flour, baking powder, and salt. Add to creamed mixture, alternately with the milk. Spread evenly into a well-buttered 8-inch round cake pan. Sprinkle the raspberries on top. Mix together 2 tablespoons each of butter and brown sugar, 1/4 cup flour, 1/4 teaspoon of cardamon or coriander, until crumbly. Sprinkle over the raspberries. Bake in a preheated 375 degree oven, 25 to 30 minutes or until cake is done. Cut into wedges and serve warm or tepid, with or without cream.